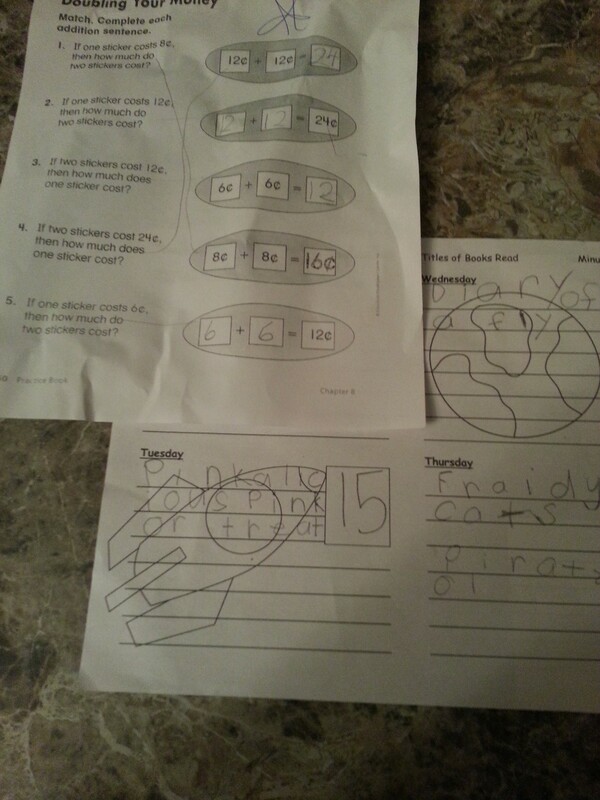 Our first-grader* has homework. Lots of real homework. Like 10-20 or more minutes of homework a day, plus reading. This, I was not prepared for. Personally, I ascribe to the philosophy (followed by the Dutch, among others) that homework before 4th or 5th grade has minimal value for kids; that they’d be better off spending that time playing, stretching their brains being creative, or using their bodies being physical. But that is not the norm in the schools where we live. So homework it is. To be fair, I appreciate the fact that my first-grader’s homework is mostly reinforcement of what she did in school that day, and not a demand that she teach herself (or we teach her) something new or a requirement that we, her parents, handhold her through time-consuming projects. I also appreciate that her homework gives me a little insight into what she’s learning and how she’s learning it, at least in math. And, fortunately, she likes doing homework (at least for now). She loves reading, and she’s always loved puzzles – by age 3 she would often sit for over an hour putting together puzzle after puzzle – and the math worksheets she brings home most days are basically puzzles. Still, that’s 10-20 minutes a day minimum I need to make sure she sets aside for homework, not counting the 15 minutes minimum a day she’s supposed to be reading and logging what she reads. Our work schedules mean that, by the time whichever parent is on pick-up duty gets the kids and gets home, it is suppertime. Best case scenario, when we walk in the door we might have 1½ to 2 hours before the kids’ bedtime. The last thing any of us want to do after a long day apart is spend that limited time together on worksheets, or stressing or fighting over getting homework done. We want to spend it connecting. By the time we all eat and the kids blow off a little steam, take a bath and get ready for bed, there’s no time for homework at night anyway (other than reading, which has long been part of our nighttime routine anyway). So I’ve gotten in the practice of setting out her homework on the breakfast counter before I go to bed, and she does it before or over breakfast each morning. Not that there’s more time in the morning (roughly an hour-and-a-half between the time we wake up and the time we all have to be dressed, fed, and out the door), but it somehow seems less hectic. And, yet, I worry that this habit – which is really the only functional way to fit homework into our lives right now – will do her a disservice in the long run. When she has 45+ minutes of homework, not 20. When it’s not something she can bang out quickly early in the morning, with a gentle nudge from mom. If the purpose of homework at this age, as we’ve often been told, is to get into the habit of doing it, is getting into the habit of rushing through it in the morning going to do her more harm than good in the long run? How do you handle homework in your house? Got any insights for me? * If you’re a regular reader of this blog, you may remember that last fall we were agonizing over whether or not to move our oldest into first grade, after she was forcibly redshirted because her birthday falls a few short weeks after the very strict school cut-off here. Long story short, after two weeks in kindergarten, many assessments by her new school, and agonizing conversations with teachers and principals, we did move her. Despite all our hand-wringing over this decision, she never skipped a beat and is so incredibly happy to be in first grade. It’s been incredible to see her go from stalling out last year to resuming rapid intellectual and social growth. Icing on the cake for us was when, at the November parent-teacher conference, her teacher told us that she’d completely forgotten our kid didn’t start the school year in her class. Cue big sigh of relief! I think setting up the routine that homework gets done is probably more important than the particular time frame. (For instance, a friend’s son has practiced piano before school for years now…it’s a time of day that he’s awake, and practicing then works well for him family.) I also think that as kids get older they naturally stay up later. We used to have the same rush to get homework done when the kids went to bed by 7:30 or 7:45. Now that lights-out is 9pm – on a night without late basketball practice or Scouts – and 9:30 or 9:45 a couple of nights a week they just have more waking hours in general. Oh, and many schools’ after-care programs actively encourage home-work time. Perhaps more so at TJ than MD?